Completely natural, no preservatives, without any flavors, purepressed olive oil cold and produced according to traditional Moroccan techniques. This olive oil is consumed preferably pure ... Completely natural, no preservatives, without any aroma, a pressed olive oil cold and produced according to traditional Moroccan techniques. Highly sought in cooking for its aromatic qualities, it is also the prerogative of diet menus for its high monounsaturated fatty acids and vitamins E and A. Rich in antioxidants (such as vitamin E and polyphenols) that help prevent cardiovascular disease, cancer and aging. In addition, it is rich in monounsaturated fatty acids, unlike saturated fat (found in butter, meat, cheese ...) reduce the level of "bad" cholesterol that clogs the arteries. It contains in particular oleic acids that stimulate bile production and ensure the proper functioning of digestion. 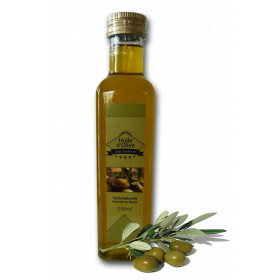 Olive oil keeps all its beneficial health properties when not heated above 40 ° C.